There's no arguing about the quality of the underlying company. Here's where our analysts disagree. The face of retail has changed dramatically in the last 50 years. At first, mom-and-pop stores dominated the scenes outside of the country's largest urban centers. But then Wal-Mart spread its tentacles across the country and provided the first-ever chain that was readily available in most small towns. For a long time, it played alone in this sandbox. But over the last two decades, Costco (NASDAQ:COST) has become a force to be reckoned with. By adopting a different business strategy -- focused on generous benefits for employees, razor-thin margins, and a membership-driven model -- the company has produced phenomenal returns for investors since going public in the early 1980s. COST Total Return Price data by YCharts. But what about today? Costco is still growing its footprint and maintaining its membership roster at impressive rates. At the same time, we are now in the age of e-commerce, and Amazon.com (NASDAQ:AMZN) is the clear king in this sphere. Below, two of our analysts debate the merits of owning -- or not owning -- shares of Costco. Daniel B. Kline: A retail war has been going on between traditional retailers and the internet, but Costco has managed to be a conscientious objector. The warehouse chain, which bases its business model on offering low prices, has done very little with its digital experience. It has a website and offers online deals for its members, but its warehouses have remained its focus. There was a time when that appeared to be a mistake because -- ultimately -- the combination of convenience and price offered by Amazon seemed like it should eventually steal business from Costco. That simply has not proven true. Recent research, which was reported on by The Seattle Times, actually suggested that the two companies can co-exist, noting that nearly half (45%) of Costco members also had an Amazon Prime membership. That's at least partly because while other retailers simply sell things, Costco offers an experience. Yes, saving money is part of the equation, but there's also an entertainment factor when it comes to visiting one of the chain's warehouses. In addition to the stock merchandise the company sells, there's always something new and unexpected, along with samples to make store visits part value and part fun. Because of its unique sales proposition, Costco has held its own while other retailers have suffered. In the company's fiscal 2016, which closed on Aug. 28, it reported comparable sales growth of 3% in the United States, 8% in Canada, 4% in the rest of its international stores, and 4% companywide when you factor out lower gas prices. The chain also managed to grow net sales by 2% to $116.07 billion over last year. Those are very solid numbers that are only likely to get better as traditional retailers go out of business or shrink their footprints. 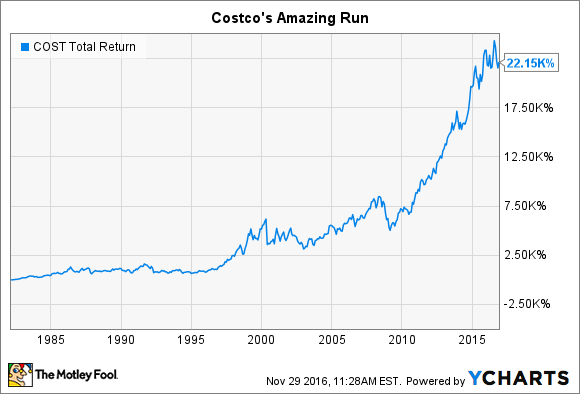 Costco has shown that it has long-term upside, and while it's expensive right now, the company has plenty of runway to grow into -- and beyond -- its valuation. Brian Stoffel: As Dan said, there's so much to like about Costco. The company has done a fantastic job of looking after all of its stakeholders: customers, employees, shareholders, and the communities where they are located. That's a model for sustainability in a world that's too often short-sighted. But the thing I can't get over is the company's price tag. Based on results over the past 12 months, Costco's stock currently trades for 28 times earnings, and 103 times free cash flow (FCF). I'm usually the last person to haggle over price, but in the case of Costco, I think these expectations are too rosy. Even at the market's elevated levels, Costco trades at a 10% premium to the S&P 500. Granted, part of the reason the FCF figure is so high is because Costco opened 29 new stores during the previous year. In the next fiscal year, the company plans to open 31 more, meaning FCF will likely continue to remain low. It's a good thing it can finance these openings without having to use too much debt. Let's consider Costco's business model, though. Virtually all of the profit the company makes comes in via membership fees. Over the past 12 months, the company turned a profit of $2.35 billion. At the same time, it pulled in $2.646 billion from membership fees. In other words, given the business model, the only way to grow enough to justify its valuation is for Costco to add more members. I think Costco can substantially increase membership, but I don't think it'll be enough. Consider that earnings over the last 12 months came in at $5.33. Analysts expect that to increase 11% over the next two years, after which the growth will only be in the single digits. In my mind, that's simply not a characteristic of a stock trading for almost 30 times earnings. I think investors would be better off waiting for better entry points. No matter how you feel about Costco's stock, it's hard to find too many problems with the company behind the stock. We'll revisit this topic in the future and see how Dan and Brian's reasoning has played out over time.